One could take a look at the recent economic figures released in Sweden and be convinced that the economy is on sound footing. 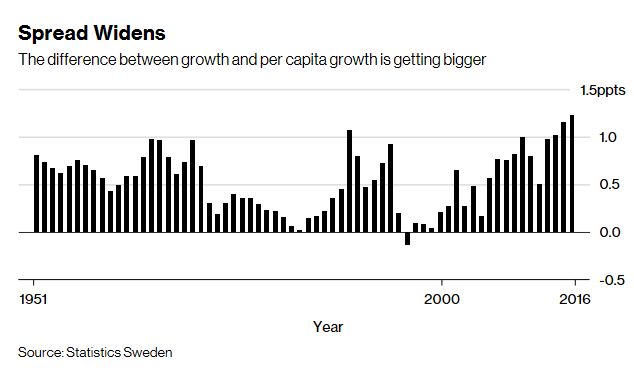 Swedish GDP increased by 1 percent quarter-on-quarter in the three months up to June, according to data from Statistics Sweden, twice the pace analysts in a Thomson Reuters’ survey expected and the largest increase in a year. You could look at just about any of the macroeconomic numbers; GDP, consumer spending, inflation, and all is well. However, once you lift the hood and see what is boiling under the surface, there are clearly issues in Sweden. There was a time when Sweden’s welfare state appeared to work flawlessly and there were not daily reports of shootings, rapes or of burning cars. It isn’t really hard to figure out why the uber-tolerant nation of a once proud ancestry is crumbling. In an attempt to be a moral superpower, and prioritize “gender equality” and the like, they have emasculated the nation and are on the brink of economic decline. The nation of 10 million people accepted 163,000 migrants in 2015, the largest number relative to the total population of any European state during the massive migrant influx into Europe that year. The difference between overall growth in gross domestic product and growth when measured per capita hasn’t been as wide since at least 1950. The accommodating Swedes who once welcomed mass immigration and afforded these refugees welfare of the state are now wondering why the economy is heading south. It needs to ensure that the hundreds of thousands of immigrants from countries such as Syria and Iraq that arrived in the past few years find their way into the labor market. Welfare to the refugees is better than work; so why work? The Swedes will find that whether it be through this election or the next, the country will change both morally and economically for certain. Those that see the canary in the coal mine that is Germany on immigration are quick to the forefront of advocating change and protecting sovereignty. Those that have yet to wake up and smell the coffee will live in a very different land in the next decade and after. The polar opposites exist in social scenarios. One wonders if the Swedes do realize that Muslims are not big fans of homosexuality or gender equality. These tolerant Swedes may come to realize the mantra of Mohammed one way or the other, which is said to be convert or kill the infidel. Not my words, theirs. “Kill them [unbelievers] wherever you find them… And fight them until there is no more unbelief and worship is for Allah alone” (Quran 2:191-193). Liberals have what I call the Homer Simpson syndrome where he tells the doctor everytime I hit my hand with this hammer it hurts. Doc says stop hitting your hand. Unfortunately, with liberals it’s not that simple. Sweden and Germany are perfect examples. Their obituary will say “liberals to the end” and the muslims will build a mosque next to it. Over 60 somali’s rioted an amusement park in Minnisota. We have our own muslim issues. I fear that once they get a foothold in govt., (and it’s slowly headed that way) things will really change and I fear the next liberal president will open the floodgates. There’s a Saudi sponsored school on the east coast that Shumer called terror high. They’ve graduated several wannabe terrorists. The democrats love shared misery and they cant wait to put a wrench into the economy. I liked the comment by Marco Rubio – Bernie Sanders is a socialist. I think Bernie Sanders is good candidate for president of Sweden. 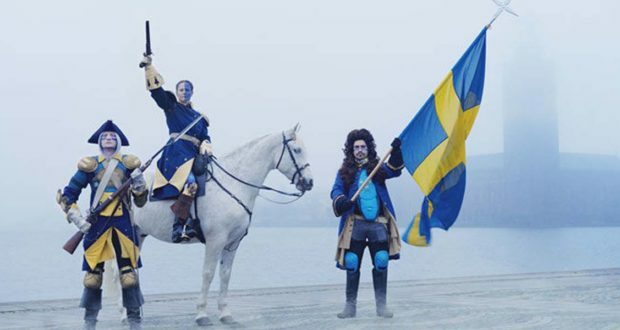 We don’t want to be Sweden. We want to be the United States of America.